Enmore Audio is a premium three room recording studio in Sydney, with the capacity to deliver an array of recording options. Designed by pre-eminent acoustician and sound engineer, John Sayers, the studio provides the optimal environment for capturing sound with authenticity and accuracy. From singer-songwriters to voiceover work, full bands to solo instrumentalists, the studio is flexible enough to to provide a diverse range of recording solutions. Our facility is among the top Sydney recording studios, and our isolated ‘dead’ room as well as our live rooms are ideal production, recording and mastering environments. We feature a wide selection of instruments, microphones, outboard gear and of course plugins. Scroll down for an overview of the recording studio, or click the following for our full range of equipment and services. The Stable is an acoustic space equipped with a Yamaha U3 upright piano and a Fender Rhodes electric piano. In this way, it’s the perfect option for intimate solo performances. Yet it can also accommodate the studio’s various guitar and bass amplifiers for live band performances or overdubs. The Stable is a warm and comfortable setting, perfect for recording vocals intimately through our selection of microphones. The room has a flat frequency response with minimal acoustic reflections, thus making it the ideal location for tracking precise and clean voiceovers for commercial and broadcast purposes. The Garden is a larger space which houses our Hammond organ and Ludwig drum kit. It’s flexible in recording capability and is ideal for small ensembles like string quartets, horn sections and vocal groups. Acoustically, the Garden is a little more “live” which allows for a little more space and the creation of a more ambient sound. Both live rooms are equipped with enough microphone inputs to run sessions big or small. Tie lines connect the Stable and Garden, making it easy, for example, to connect guitars and amplifiers in separate soundproof environments. Large windows allow for maximum eye contact and the feeling of togetherness when recording as a group in separate rooms. To capture the sounds, we have a diverse pallet of microphones. From drum kit classics like the Sennheiser MD 421 and Beyer Dynamic M88 to guitar cab favourites like the Sennheiser e906 and Shure SM57. High fidelity acoustic sounds can be enhanced with the Royer R121 or our pair of Oktava MK-102s. Broadcast quality voiceovers can be achieved with our Shure SM7B and our Electrovoice RE-20. 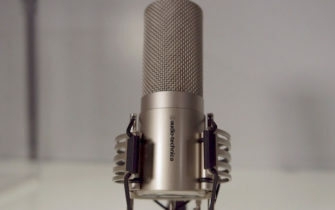 For silky smooth and intimate vocals for a song, the Neumann M-147 tube condenser mic is a must. Our instrument list is also available to performers. Our carefully curated selection includes the aforementioned items that reside in the live spaces, as well as vintage acoustic and electric guitars and basses, powerful synthesizers and percussion. In the software realm, we offer premium sampled instruments from East West, Trillian, Arturia and BFD. The Kitchen is Enmore Audio’s control room and is the home of our outboard gear, monitors and 6-core Mac Pro – powerful enough to drive any session. The Kitchen is situated between both live spaces, making communication between the control room and artist seamless and natural. Analog “colour” is available through our selection of preamps and compressors. Our ever-growing assortment of outboard kit includes the industry favourite Universal Audio 6176 preamp and compressor, the Phoenix DRS-8 multichannel preamp, and our pair of the extra-juicy, valve-driven Groove Tube “Bricks”. More extreme effects can also be incorporated through our collection of Moog outboard (Analog Delay, Ring Modulator and Freq Box) and some of our quirky stompboxes (including analogman mods and pedals from local boutique maker, Ivan Richards). The Apollo 16 is our premium digital to analog converter, which makes it possible to record pristine quality audio, without having to make sacrifices for latency. The Apollo interfaces with Pro Tools, the industry standard in recording software. There’s no shortage of recording studios in Sydney and we’re well aware of that. While we’re a fully equipped recording studio with a great environment and the capacity for a wide range of recording options, working in an environment that is both comfortable and inspired is essential. If you have any question or would like a tour of the studio, get in touch with Radi or Dan.